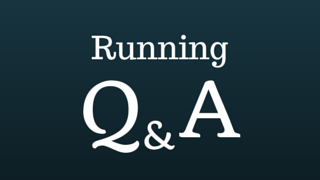 Diz Runs With… Q&A and More! Today, I’m running solo again! One of the things I love doing, whether it’s on the podcast, on twitter, or wherever is helping answer questions for those that have them. Doing Q&A episodes are one of my favorite ways to take questions, because there are always more than one people with the same questions, so it’s nice to be able to help multiple people at the same time. Today, in addition to answering questions, I’m also offering a few announcements of things that are happening on the website, things that I’d like to do in the future, and ways that you can help support the website/podcast without spending a penny. New soreness from a recent 10 mile race, how can I prevent it in my upcoming half marathon? How does my half marathon time help me to predict my full marathon pace? How come I can kill it in one form of cardio exercise, but I can hardly run any distance at all? If you’d like for me to answer a question in an upcoming Q&A episode, please feel free to ask! You can submit your question here, or shoot me a question on twitter. https://i1.wp.com/www.dizruns.com/wp-content/uploads/2014/10/DizRuns.com-Presents...-4.png?fit=320%2C180 180 320 Denny http://www.dizruns.com/wp-content/uploads/2015/01/Logo-Trans.png Denny2014-10-10 06:02:332014-12-24 12:51:11Diz Runs With... Q&A and More! Why is Laura Parson Running 3,030 Miles in 67 Days?